The popular series of Graupner COMPACT motors has now been considerably expanded with the introduction of a number of new types. Several motors are now available for the larger, higher-performance models weighing up to 10,000 g.
Matching these motors are the high-performance COMPACT-CONTROL controller types (see page ) and carefully matched LiPobattery packs (see page ). The small motor types with the "Z" suffix are an excellent choice as COMPACT power plants for small Depron® models; they are available at very reasonable prices. 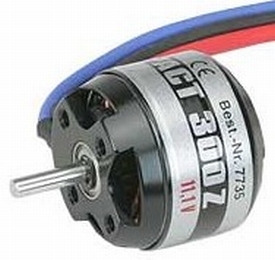 The motors in this series are supplied complete with comprehensive accessories including propeller hub, motor mount and gold-plated connectors with heat-shrink sleeves. The motor types with the "VA"suffix are specially designed for the new variable-pitch propeller, Order No. 1382. These power plants feature a tubular shaft through which the propeller pitch can be varied proportionally by means of a servo-operated pushrod. they represent a very attractive, low-cost power system for these models.The new COMPACT motors of the 540 to 630 sizes round off the top end of this range of motors. The 630 motors constitute excellent power systems for models such as the TAXI 2400 and EDGE F3A 2x2. - For an aerobatic model an input power of around 1 W per 3.5 g model weight is required. - For a sports model, e.g. PIPER around 1 W per 6 g model weight is required. - For a powered glider a power of 1 W per 8 g model weight is required. The approximate input power can be calculated fromthe formula: input voltage x input current. This calculation automatically takes into account an efficiency of around 80%. The formula only applies if an accurately matched propeller is used. Please note that a LiPo cell still produces a voltage of around 3.3 V under load. The required input power for a model is calculated as follows: P = all-up weight per 1 W power. The maximumall-up weight for a BRUSHLESS motor is calculated as follows: Max. all-up weight = input voltage x input current x weight per 1 W power. Example: COMPACT CONTROL 630 30 V, Order No. 7723, powered by 10 LiPo cells of 4.8 Ah capacity. The continuous current (for an aerobatic demonstration model) is to be around 60 A. Max. all-up weight = 33 V x 60 A x 3.5 g / W = 7 kg.